Skin Soft™ Silicone uniquely developed for beginning teethers. Silicone bristles gently massage tender gums and aids in the break through of first teeth. Introduces greater pressure with large teething surfaces to aid in eruption of new teeth. Firm surfaces and Massaging Nub-eez™ offer greatest pressure and assistance in this stage of teething. 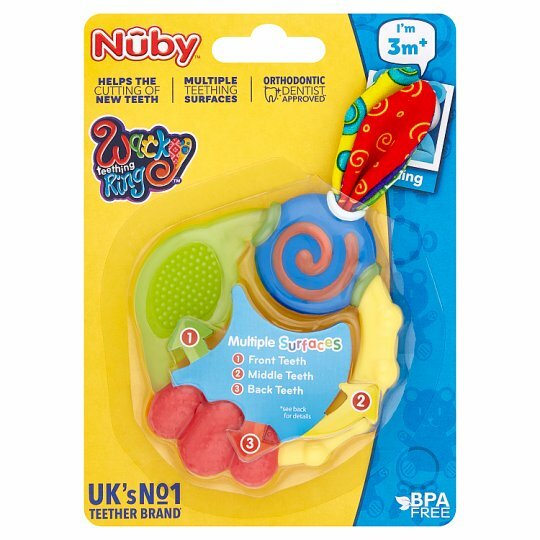 Wacky teething ring by Nûby™ features raised, offset surfaces that assist in the eruption of teeth by gently massaging infant's gums. We also made the Wacky Teething Ring easy for your baby to hold and sized it for maximum effectiveness. Soft, colourful fabric crinkles with baby's touch. All Nûby's products are made of safe, durable materials and exceed all government safety regulations and standards including. Care Instructions: Clean before initial use and after each subsequent use. Wipe surface with a damp cloth or sponge using mild liquid soap. Wipe clean with clean water. Air dry. Do not bleach. Do Not Immerse in Water. Please retain these instructions for future reference. WARNING: Please retain company name and address for future reference. Inspect the teether immediately before and after each use and throw away when damaged or punctured for example by biting. Do not clean or allow to come into contact with solvents or harsh chemicals. Damage could result. Wipe clean only. Not suitable for steam, microwave or boiling sterilisation. Do not submerge in water. Not suitable for dishwashing.